Divide and Conquer: The Story of Roger Ailes release date was Friday, December 7, 2018. This was a Limited in theaters release. 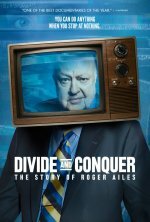 Divide and Conquer: The Story of Roger Ailes deftly fuses the personal, the political and the surreal as it charts the rise and fall of Fox News mogul, Roger Ailes. A key media consultant to Presidents Nixon, Reagan and George H.W. Bush, Ailes powerfully shaped American political history. But after creating a ratings powerhouse, he went down in flames amid scandal, paranoia, and multiple sexual harassment allegations.